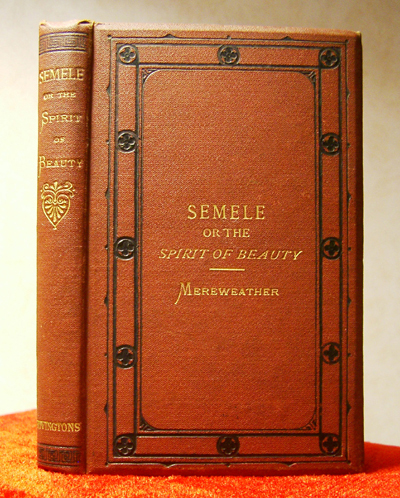 John Davies Mereweather, Semele; or the Spirit of Beauty: A Venetian Tale, Rivingtons, London 1867. Price as advertised in The Western Daily Press: 3s. 6d. 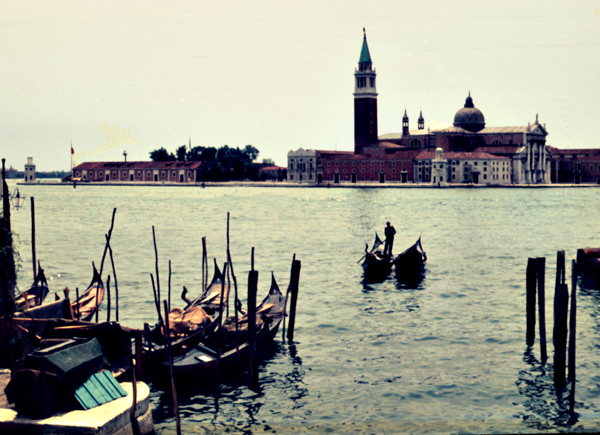 Mereweather loved Venice, its cultural heritage, its beauty. Semele of Greek mythology is turned into an orphan daughter of noble Anglo-French lineage. She explores the city and the lagoon giving the reader something of a guided tour. After her wish to see the Spirit of all Beauty is granted, she goes mad; she dies a few months later. The book, which impressed an Italian reviewer, became something of a guide to Mereweather's own inner struggle "loving Beauty and Art, Spirit and Embodiment, with a frenzied enthusiasm, excluding all rational consideration of human duties and every-day life" (Semele, p. x). The set-up can be boring: the Spirit is the poetical cicerone of Semele who, in turn, is guiding the reader. 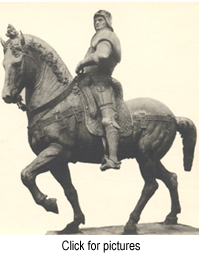 Nevertheless, the book is full of cultural, historical and linguistic details, including an interesting description of the tableland of the Sette Comuni in the province of Vicenza. Click on the Sette Comuni link above. See below for some extracts. Various illustrations have been added. Semele "fixed her residence in a large palace [Palazzo Contarini dal Zaffo] at the northern extremity of Venice near the church of Our Lady of the Garden [Madonna dell'Orto]. The view from the balcony of the first floor, or Piano Nobile, of this palace was a thing of enchantment. Below was a fertile garden rich with gay flowers and intersected by straight alleys sheltered from the rays of the sun by vines trained on trellis-work. Fig, almond, peach, and pomegranate trees were studded here and there, whilst some funereal cypresses toned down the laughing scene around. To the garden succeeded an extensive grass plot, having in the midst a large, empty basin of stone, presided over by some colossal water-deity, attitudinizing in all the mannerism of seventeenth-century art. This lawn terminated in a balustrade slightly raised above the level of the lagune, the waters of which caressed its base with their ripplings. 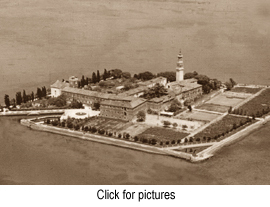 About a mile away in front, couched upon the mirror-like sea, lay the island of Murano, rich with fair gardens, and displaying its two massive church towers, one uncrowned with cupola. To the right of Murano, and about half a mile apart from it, gleamed in the clear atmosphere the church of San Michele and the walls of its adjoining cemetery; ... ... Three hundred years before, great and ingenious minds such as Titian, Sansovino, Navagero, Pietro Aretino, and Sanmicheli were wooed to recreate in this favoured spot; and in a spacious mansion near, since called Il Casino degli Spiriti, probably germinated those flashes of genius and triumphs of art which have illustrated the Italian name throughout all lands." (Semele, p.37ff). Click on the Venice Map link above.
" * Let no one think that Venetian winters are devoid of cold. What with the occasional Bora (Boreas), blowing from the north-east over the snow-covered Alps, its girdle of water, and its total absence of those endless appliances which in northern regions regard animal comfort, Venice, during the greater part of the months of January and February, is practically one of the coldest places in Europe to reside in. In January, 1858, the author saw the whole Lagune frozen thickly over between Venice and Mestre, the thermometer falling to 12° below zero (Réaumur) [ -15° C]. 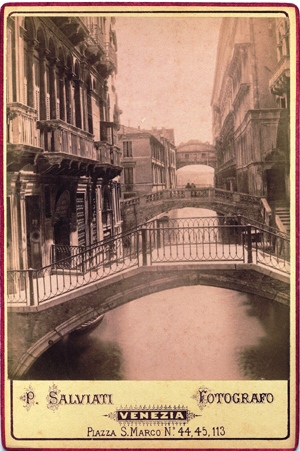 In other winters, the small canals in Venice are frequently frozen over. Whilst these frosts last, the nights feel milder than the days, during which, in spite of a good stove in the sitting-rooms, the pen will fall from the numbed fingers of the writer, shivering under a freezing temperature. 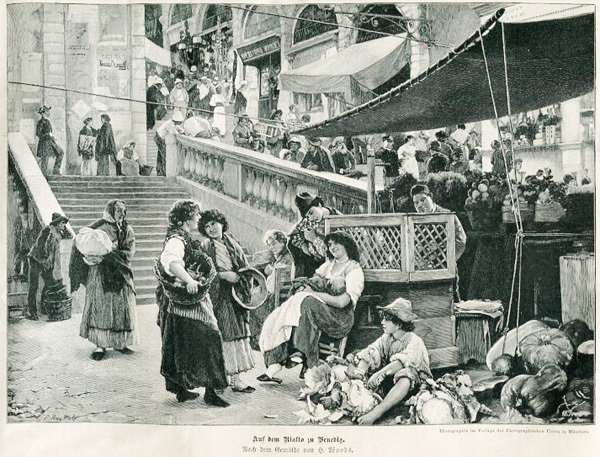 Perhaps the following notes of extremely cold seasons in Venice will not be uninteresting to the reader. [Here follow comments on the severe winters of the years 568, 852, 1118, 1413, 1419, and 1431 when] a frost commenced the 6th of January, and lasted until the l2th of February, during which interval a bride came from Mestre in a carriage over the ice, bringing her dowry with her, [as well as 1486, 1514, 1548, 1549, 1598, 1601, 1608, 1684, 1709, 1716, 1740, 1758, and 1788-1789 when] the Lagunes were frozen over from the 28th of December to the 24th of January, and a road was kept clear to Mestre, by which passed all the heavy and light traffic, and public-houses and amusements were rife upon the ice. On the night of the commencement of this frost many people died of cold in the streets, the houses, and the cafes." This would be Edith Millicent Bronson. She was born in Newport, RI, USA, in 1861. In 1895 she married Count Cosimo Rucellai, Florence.